Growth hacking is one of those buzzwords online marketers love and use often. And when someone tells a growth hacking story, it often sounds simply like magic. In this episode of Marketing in Minutes, I will look behind the magic and explain the process that leads to those massive results. Growth Hacking, What you need to know! Can’t we just do growth hacking? The answer you have to give is: Yes, you can and you should… and you probably are doing it already. But first, you have to understand what you are talking about. Welcome to Marketing in Minutes by The Social Ms – the podcast that gives you everything you need to know about one marketing topic per episode. I’m Jonathan Gebauer and today, let’s talk about Growth Hacking: What it is and why you absolutely need to know how it works. When you look at common growth hacking examples that you can find on the web, they often seem like magic. Someone has a clever idea and suddenly a company explodes. The reality is usually something else. There is no clever idea, and a growth hacker isn’t someone who sits in the company and suddenly has a lightbulb above his head. The clever idea you read about was the result of a process which cost the startup weeks, months, or even years before it resulted in the massive growth that you read about. So before I continue with stories about what growth hacking can achieve, let’s define the term. 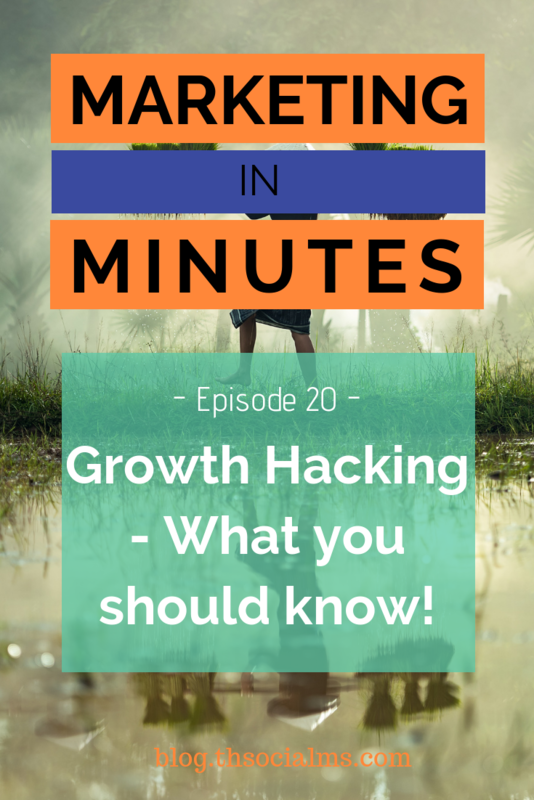 This definition is awesome – because it really identifies what is important for growth hacking, and that’s a process of experimentation and providing a link between different areas of the business to focus on growth in all of those areas. In fact, growth hacking needs to be part of your business as a whole to work as it should. But if that is true, what does a growth hacker actually do? Here is what that means: Growth hacking differs from other marketing approaches in that it focuses only on growth – fancy ideas like brand and reputation management, public relations and so on are only secondary at best. A growth hackers job is to come up with ideas – or more specifically theories – on how to grow the company and then testing those theories with the help of other departments of the company. And through a series of small tests, a scalable growth strategy will evolve. So if growth hacking is a process based on experimentation, how does that look in reality? Let’s discuss a few common examples of growth hacking – they will seem a bit like magic at first sight, but when you look at the details, you will understand how they result out of the process of growth hacking. Instead of focusing on the magic, I will try to identify how the magic really happened. One of the earliest and most commonly told examples of growth hacking is the growth story of Hotmail. In 1996, Hotmail was one of the first free web-based email accounts – which at the time was revolutionary. Suddenly you could have a free email address that was independent from your ISP – so you wouldn’t lose it if you quit your ISP contract and you could access it from anywhere in the world. In just a couple of months, the company was able to get 20.000 users – which was pretty good, but as a free service, this wasn’t enough. They started adding a single line of text below every email sent through Hotmail: PS: I love you. Get your free e-mail at Hotmail. And a link to the Hotmail signup page. The result of that single line of self-promotion was massive: 6 months later they had 1 million users, another year later, they had 12 million – and sold their company to Microsoft for 400 Million Dollars. This really does look like a magic trick, right? Add a single line to the email and you get rich and famous. If you think about it, it’s probably not magic after all – it’s a result of looking carefully at existing data. The legend is that this line is a result of a brainstorming meeting with the founders and investors of the company, and in this case, the legend is probably true. But it’s probably not the full story. The truth is, that the founders of the company probably used their own service right after they launched, and added a similar invite to their own emails. And looking at the results, in that meeting, someone said, hey, that worked for us. And somebody else said – why don’t you do this with every email, it’s your service, you can do what you want. What’s also true is that there was a lot more work to be done: This could only work, because the Sign-up page explained all the benefits of a free Hotmail account and because those benefits were something the people clicking really wanted. And if they hadn’t optimized every step, this wouldn’t have worked at all. The growth hack used by hotmail also looks like magic today, because it seems so simple. But what you shouldn’t forget is that this was 1996 – viral marketing wasn’t just new, it wasn’t really invented in that way yet. Which also means that the target audience wasn’t as hard to convince as they are today, as today, viral campaigns are thrown at you from everywhere. Which is why I want to talk about another example of growth hacking: The story of the rapid growth of AirBnB. AirBnB had a lot of problems when they started. They hustled for years and didn’t really get anywhere. As you probably know, the idea of AirBnB is to rent out private homes instead of hotel rooms. In 2010, their biggest problem was that they had a competitor that had one advantage – everyone was on the competing platform – and almost no one was using AirBnB. Which meant there was no advantage to posting any properties on AirBnB for potential users. That competitor was Craigslist. So what did AirBnB do? They built an integration from AirBnB to Craigslist which allowed their users to repost their offering on AirBnB to Craigslist with the click of a button. And through that one feature, they could suddenly offer a benefit to users. These users could suddenly post to two platforms at once and take advantage of AirBnB’s better design and features. It was anything but simple: Craigslist didn’t offer an easy way to integrate anything into their platform. Building an integration into the competing platform was a tough piece of development and a considerable investment for a small startup like AirBnB. You can be sure that they wouldn’t have done it without being at least 99 percent sure it would work. So, it’s probable that they had tested out whether it was going to work by offering to post listings to Craigslist for their users. And then doing it manually! Or something similar. However it was done – this is the growth hack that enabled AirBnB to grow as rapidly as they did. By today, growth hacking has evolved into the standard mindset of online marketers. If you are doing anything online, you are in large parts engaging in growth hacking tactics. Whenever you run an experiment comparing two different landing pages, you are growth hacking, when you write a blog post for a specific keyword to earn traffic, you are also growth hacking, when you automate a social media activity that already leads to a lot of engagement, you are growth hacking. But that doesn’t mean you can’t get better at it. Growth hacking is a puzzle – and you won’t be able to see the big picture without getting quite a few small pieces into their right place first. Don’t expect big results by having a simple idea that then magically takes off. I hope you enjoyed this episode of Marketing in Minutes. If you did, please share it with your network and subscribe to the podcast. And if you can find the time, review the show on Apple Podcasts or whereever you listen to podcasts. 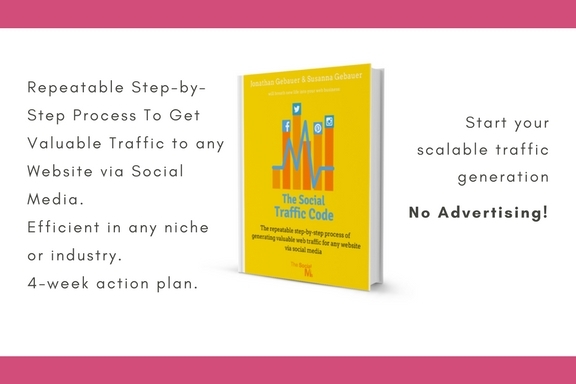 If you want to find out more about today’s topic, check out the show notes which you can find at blog.thesocialms.com/mim-20 and if you want to learn more about our step-by-step growth marketing approach for bloggers and small businesses, check out our book, The Social Traffic Code! I’m Jonathan Gebauer and you’ve been listening to Marketing in Minutes!